The hosts of A Functional Democracy’s launch party welcome guests and begin the party by introducing themselves. From left to right stands Amy Stansbury, Jordan Shade and Hal Wuertz. 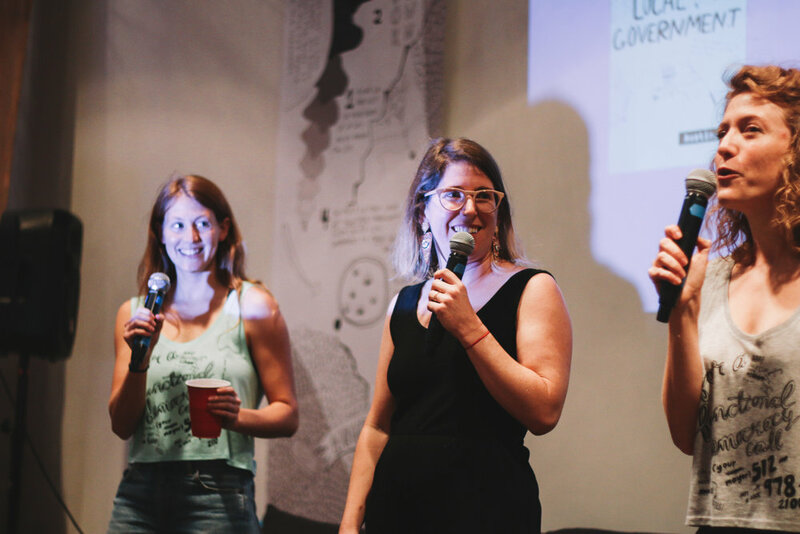 A Functional Democracy, a local civic engagement organization, celebrates the launch of their zine, “A Beginner’s Guide to Local Government,” as Texas gears up for the upcoming midterm elections. Who is the mayor of Austin? What district do you live in? Who is your city council representative and what do they do? These are a few of the questions that Amy Stansbury, co-founder of A Functional Democracy, answered through their new interactive zine. Participants paint posters with the word “vote” in an effort to promote its importance, especially in this upcoming election. 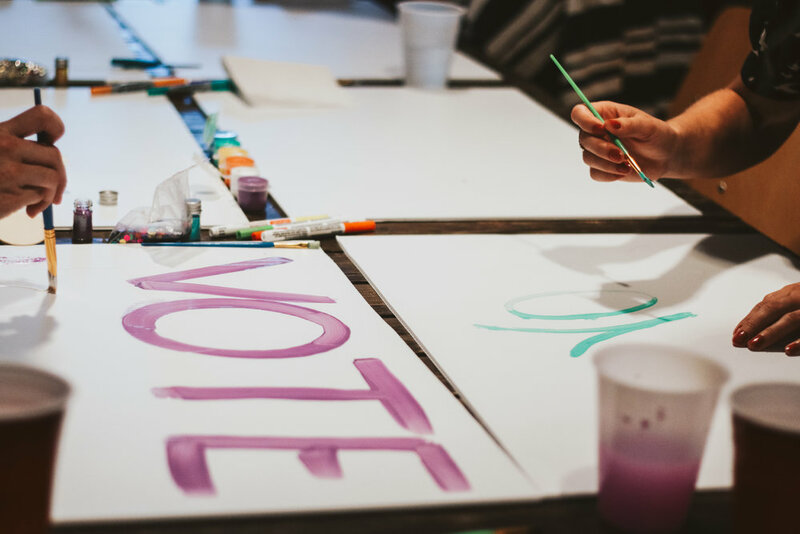 When trying to find ways to engage millennials in local politics, Stansbury met her partners and co-founders Hal Wuertz and Jordan Shade, two local artists seeking to promote civic engagement through their art. On Tuesday, Oct. 2, Stansbury, Wuertz and Shade hosted their zine launch party. Through interactive civic art installations and lighthearted Q&A’s with local elected officials, they sought to educate and inspire locals to get involved. Attendees views an informative poster titled “Bond Store” at Gather Venue for the launch party hosted by A Functional Democracy. Recent Austin transplant and AmeriCorps member, Alex Holland, attended the event as a first step toward doing something about the issues that concern him. “I didn’t realize that Texas has one of the lowest voter turnouts,” he says. “It would be impactful if more people thought they could make a difference by using their voice and voting. Events like this can help people become aware of how to get involved and why it matters.” Holland soon hopes to help register voters or become part of an advisory board. The event also included comedians performing political stand-up routines. Adrian Villegas, artistic director of the Latino Comedy Project (LCP), sought to both educate and enrage.“I wanted to support this event because LCP tries to serve the same function of informing and galvanizing people to action through comedy about issues and culture,” Villegas says. Villegas’ most recent show, “Gentrif*cked,” was inspired by the ongoing issue of gentrification of East Austin. “I know that some of the things on the videos I showed will hit some people right where they live, literally, and where other people used to live,” Villegas says. Adrian Villegas of The Latino Comedy Project, performs a comedy skit. LCP is known for its political and pop culture satire. With the Latino vote in mind, Stansbury talked about applying for grants in order to translate the zine to Spanish and create a San Antonio edition. “Our goal is to not just translate it but to also work with a partner organization or Hispanic artists into making it a guide that’s more culturally relevant and representative of the community,” Stansbury says. The zine can be purchased at Bookwoman or on their website.